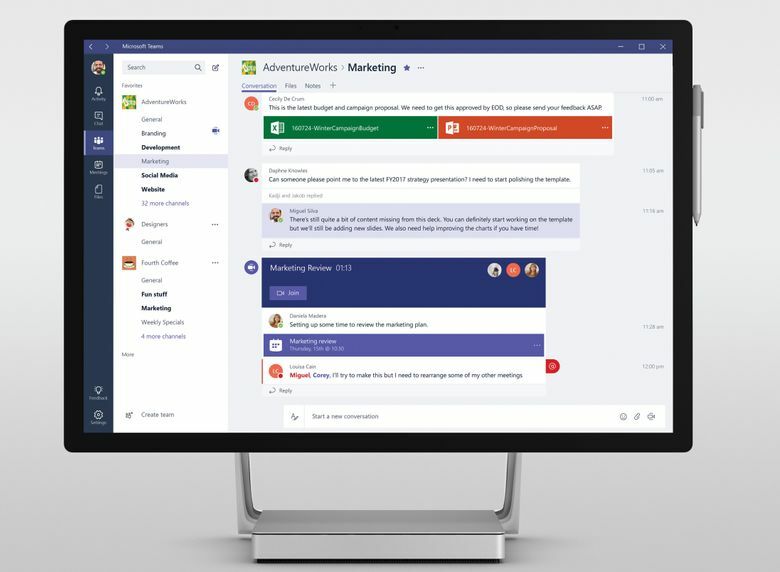 Microsoft has introduced a free version of Teams, a workplace collaboration tool aimed at the success of chat software startup Slack. The free version of Teams, which will be limited to 300 members per group, will not require an Office 365 subscription. Microsoft has upped the ante against popular chat software startup Slack by launching a free version of its own chat service, Teams. The Redmond company announced the free option Thursday, which is now available to groups of 300 people or less. Teams was previously accessible only to Office 365 subscribers. Offering a free version will be an easier way for companies interested in the service to try it out, and could serve as a gateway for more businesses to sign up for the full 365 suite. It also lets Microsoft compete more directly with Slack, the San Francisco startup that has been a massive hit for workplace instant messaging. Slack allows groups with an unlimited number of members to use the service for free, but adds restrictions that limit those groups to 5 GB of storage space and saving and searching up to 10,000 recent messages. The “freemium” model encourages groups to upgrade to a paid tier that increases storage space, saves all messages and adds other features. Similarly, the free version of Teams limits the storage space but is more generous than Slack at 10 GB, plus 2 GB of personal storage for each member. Teams also allows users to save and search unlimited messages. Phone calls, recording meetings, increased security and other features are added if businesses decide to upgrade to a paid version that requires a subscription to Office 365. More than 200,000 businesses now use Teams as part of Office 365, Microsoft said.